See more objects with the tag domestic, tool, presentation drawing, mechanical, sewing, industrial designers. This is a Drawing. It was made for (as the client) White Consolidated Industries. It is dated 1970 and we acquired it in 1992. Its medium is pastel, brush and gouache, pen and black ink, graphite on paper. It is a part of the Drawings, Prints, and Graphic Design department. 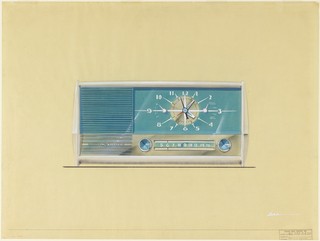 Richard Arbib began his industrial design career working at General Motors' World of Tomorrow pavilion at the 1939-1940 World's Fair. He continued as a car stylist at GM, then went on to work for major US government and independent manufacturers throughout the second half of the twentieth century. Arbib has said of design: "If you’re going to be creative, I think you should do it in as many fields as possible . . . Creativity is like a rubber band; you can stretch it, or not stretch it." Arbib stretched his creativity to designing ocean liners—he is responsible for adding the top deck to cruise ships—as well as everyday objects like refrigerators and wristwatches. 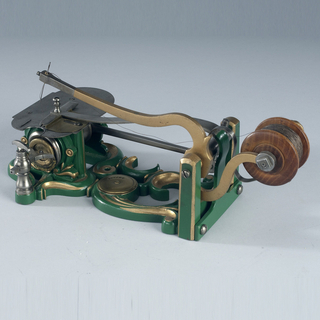 For White Consolidated Industries, he designed the first portable sewing machine, for which he received nine patents. 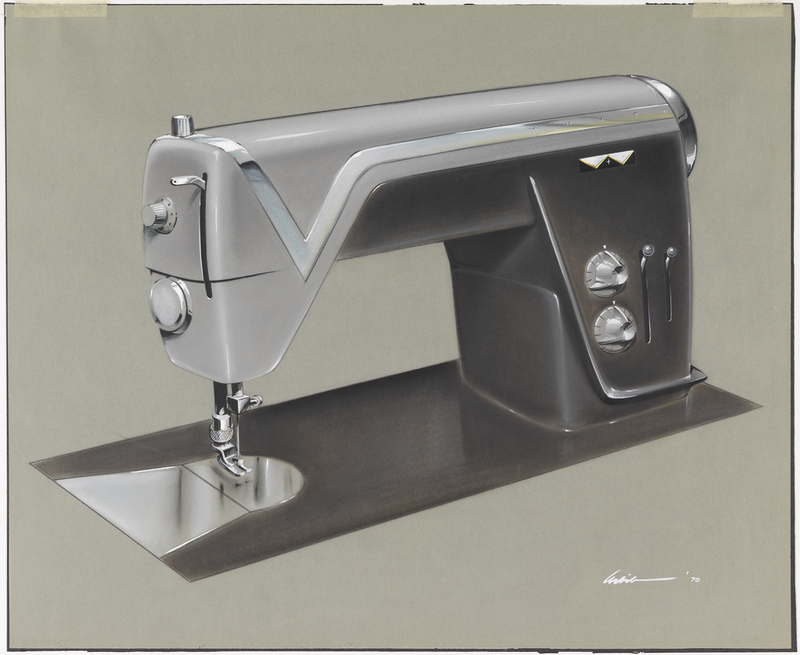 This presentation drawing for a sewing machine displays Arbib’s characteristic sleek and futuristic design style, which he termed "plastonic," as well as his rendering skills. Arbib helped to raise the standard of these preliminary drawings with colored sketches that showed imagination, detail, and artistry. This object was catalogued by Karin Zonis and Carey Gibbons. It is credited Museum purchase through gift of Mrs. Griffith Bailey Coale and from Eleanor G. Hewitt Fund.